What is Practical Business Design? Practical Business Design takes the best elements of many business models, simplifying and linking them together giving you the traceability to see how the pieces of your business fit together. The method looks at more than just the Business Model (what your business does) or the Operating Model (how your business works). It includes your business strategy and how you plan changing your business, ensuring you use your budget more efficiently. 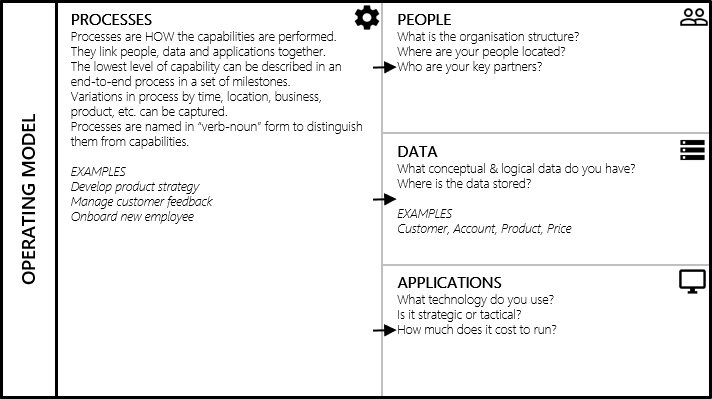 The Practical Business Design Canvas provides a simple structure for you to organise your thoughts about your business. It can be used in poster form or on a whiteboard for workshops, using sticky notes for your ideas. The Strategy Model describes what your business is and what you want it to be. It is important to be able to write down what you want to achieve to ensure that what you do in your business will actually achieve those ambitions. Otherwise, you can never really know if you’ve succeeded or not. Drivers are things that make you want or need to change your business. These can be factors such as new regulations or new competitors. They might be opportunities from new technologies. Drivers influence your goals. They describe why you want to change your business. Your goals could be described in a hierarchy. For example, a goal to “increase revenues” could mean “increase number of shops” and / or “increase number of customers”. The “increase number of shops” could be broken down into “increase number of shops in London” and “increase number of shops in Paris”. Goals are fine to describe high-level aims, but how do you know when they are met? Is one additional shop enough or ten or fifty? If you want ten shops, is it good enough to open them in this year or in the next five years? Each goal should be described by an objective. Like goals, objectives can be placed in a hierarchy also. For example, a cost reduction target for the whole company could be split across different business divisions. This way, there is accountability for what the business wants to achieve. In an established business, Change describes how you plan to achieve your objectives in the Strategy Model. It includes one or more courses of action which are the ideas you come up with and programmes & projects which are how you will implement those ideas into your business. For a start-up company, the courses of action might represent the ideas you want to kick-start your business. For each course of action that you want to implement, you normally require a project (small scale change) or a programme (collection of projects, implementing a large scale change). Programmes & projects should have a business sponsor; someone in the business who wants the change and is prepared to fund it. Programmes & projects will have specific success criteria, aligned to the objectives they are supporting. By defining these up-front, it is clear how the change is meant to support the goals of the businesses. This gives you the traceability to track progress of your business goals as projects get delivered. The Business Model describes what your business actually does, what it sells, who to and what that relationship with the customer is. Customers are the lifeblood of your business. They are the reason you exist. Customers may be individuals, other companies, governments. They are the people that pay you for the products and services you offer. Customers can be segmented, for example, geographically or by income or by size of business. You may want to offer these customer segments different levels of service or different types of products. Products and services make up your value proposition; what is distinctive about what you sell. Do you offer a better quality product? Is your service quicker than your competitors? Or are you simply cheaper for an equivalent product? These interactions are a key part of building a successful business and it is important to always be aware of the customer’s expectations, needs and feelings throughout. 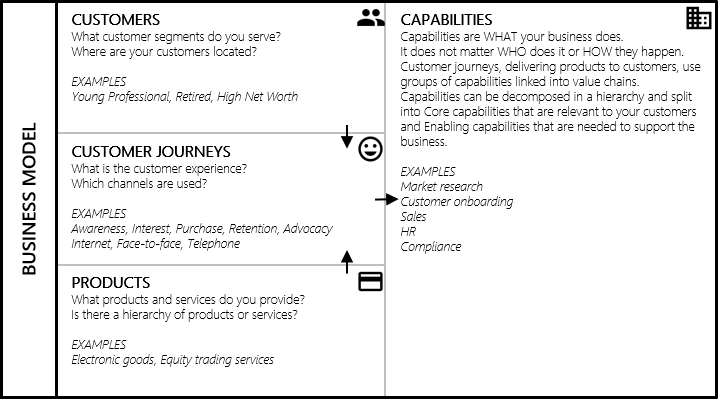 Business capabilities are what your business actually does. These include customer-facing capabilities like Sales, Marketing and Customer Support. Also, they include supporting capabilities like HR (Human Resources), IT (Information Technology), Legal, Risk and Compliance. Note, it does not matter here who does these things or how they do them. That is covered in other sections of the Canvas. The Operating Model describes how the business actually works, by taking the lowest level of capabilities and drilling down into the detail of the business processes within them. The processes, which are a set of steps, link people, business data and applications together. Whereas capabilities describe what the business does, processes describe how they are performed from start-to-finish. You may have a Customer complaints capability, but the process that is used could be different by location or business unit or customer type. Processes enable you to document these differences. Capabilities should be decomposed (drilled-down into more detail) until you get to a point where you are describing a set of steps that occur one after the other. This is your top-level process. Now, it might be that in one country, there are some additional legal checks to be made after #5, so this would be documented as a regional variation for that country. Processes can capture who does the task (this might be a department or team or individual role), what business data they are using and updating and what software applications they might use. Like capabilities, process steps can be drilled-down into more detail. Your business will most likely have people working in the organisation. It could be only a few people to tens of thousands. These people will have some sort of organisation structure where they report to managers based on what they do. The business will also work with external partners. These might be suppliers, agents, trainers, etc. These can all be involved in the processes. The location of the people involved may be important, so it is useful to capture that detail in the Canvas. For example, you may have employees in data-sensitive countries, for example, Switzerland, that require additional training or certification. We do not need to worry about the implementation of these in any detail. That is in the realm of IT architecture teams. The location of data is particularly important because of data confidentiality regulations and how they differ between countries. You should be aware of data protection regulations in the countries where you operate and potentially where your data is stored. These are the software applications that you use. In this case, we do not normally include Microsoft applications like Word, Outlook or PowerPoint. Microsoft Excel is usually included where a specific application has been written in Excel VBA, for example. Applications can be used by people or can be integrated with other applications. You should be aware of security themes, such as encryption, hacking attacks and backup plans and treat these as risks requiring mitigation. Applications can support one or more capabilities and these can be displayed on a capability model. It is important the metrics are able to be measured in a repeatable fashion to ensure continued monitoring. KPIs are a specific type of metric; one that the business is particularly interested in. You can think of a KPI as a metric that the business would pay to double (or half). A business might be able to measure lots of different things, but the business should pick a top five to focus on. Dashboards can be set up to track and report on these metrics and KPIs which can then feed into updates on the Strategy Model at regular intervals. It also lets you link these together, to start getting a view of the relationships between them and let you see your business in a new way.